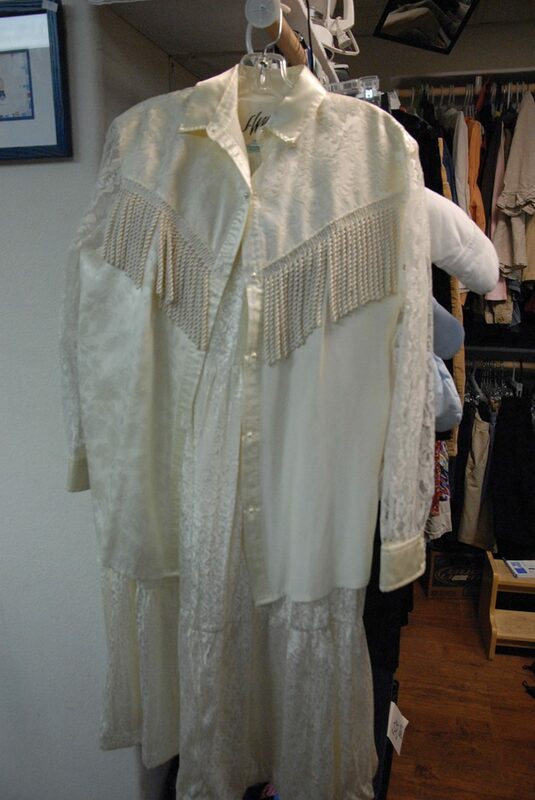 This Western-style wedding dress is a unique clothing item that can be found at M&M's Secondhand Store on Fourth Street. M&M's owner Michelle Nolan likes running the store because she comes across items like this every day. Michelle Nolan has enjoyed frequenting thrift stores for years, shopping for her friends and family and always finding good items for great prices. That’s why her friends told her to open a thrift store of her own last summer, when the market was wide open. Dorothy Wyman had closed her thrift shop on Victory Way, Charlotte’s Web was on hiatus and only the Community Budget Center was providing the low prices. So Nolan opened M&M’s Secondhand Store, 80 E. Fourth St., in July 2011. She figured it would be a fun business to run. Nolan had a quick in to get a large inventory when she started. She works as a ladies’ auxiliary in addition to her duties at the store and was able to get supplies from the seniors she worked with as well as their families. There also are books, shoes and free stuffed animals to be found in the store, along with other odds and ends. It’s why Nolan has enjoyed owning a shop. In the 16 months since Nolan opened M&M’s, Charlotte’s Web has reopened and three new thrift stores have started in Craig. She doesn’t see that as a problem. Union Wireless earlier this month was awarded almost $23 million to help bridge gaps in mobile coverage throughout Wyoming. The Federal Communications Commission awarded the money through a market-based reform of the Universal Service Program, upon finding $300 million in savings from cutting waste and inefficiency to the new Mobility Fund. Jan Fasselin, of Union Wireless, said the company had to bid on coverage areas and whichever company provided the lowest cost per mile received the bid. The goal of the fund is to improve high-speed data access to rural areas of the U.S. According to a news release from Union Wireless, the funds will allow the company to cover an additional 13,577 miles of roads in Wyoming. The release said the FCC requires winning companies to raise millions of dollars in private investment to complement the mobility auction funding. Woody said the match is basically coming out of what the company normally spends on capital build-out. The auction rules require winning companies make their networks available to other providers’ customers for roaming purposes. That rule allows everyone to benefit from the expansion. Woody said the company has roaming agreements with several national and international wireless companies. “Union has built an extensive regional network with the goal of converting it to the next generation of 3G and 4G wireless services. With this funding, Union will be able to provide a vast high-speed network for the public’s benefit,” Woody said in the release. Union Wireless serves Wyoming, Northwest Colorado and northeastern Utah. Woody said the money would allow the company to do about double what it normally does in network build-out over the next few years, saying the company normally spent between $20 million and $30 million a year through Wyoming, Colorado and parts of Utah.